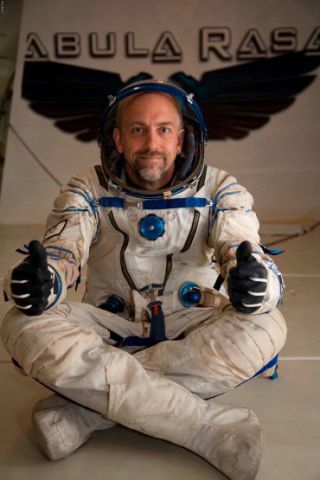 Spacetourist-to-be Richard Garriott is taking requests for what may be the ultimateorbital postcards from the International Space Station (ISS). Garriott,an Americancomputer game developer training for an October launch, will take customphotographs of Earth for about 200 paying subscribers under a partnership withthe ?Earth Portraits? program of the Association of Space Explorers (ASE) andthe space history and memorabilia Web site collectSPACE.com. ?TheAssociation of Space Explorers' Earth Portraits allows me a way to share theexcitement of seeing the Earth from orbit with enthusiasts from around theworld,? Garriott, 46, said in a statement. ?I look forward to taking theirpictures from space.? Based inAustin, Texas, Garriott is paying about $30 million for his plannedOct. 12 launch to the ISS with two professional astronauts under a dealbrokered with Russia?s Federal Space Agency by the Virginia-based firm SpaceAdventures. He plans to perform a series of experiments and educational outreach projects during his flight in addition to the Earth Portraits program. Garriott developed the Ultima online and Tabula Rasa computer games, andis the son of retiredNASA astronaut Owen Garriott. Thenon-profit ASE is a group of 300 flown astronauts and cosmonauts from 32countries. As part of the Earth Portraits program, a limited number of 200subscribers can pay $500 a piece to have Garriott snap a photo of any locationon Earth, so long as it is visible from the ISS during his week-long stay. Theactual latitude and longitude of the location is required to request an EarthPortrait, with all reservations due by May 23. ?The viewof Earth from space has been captivating astronauts and cosmonauts since YuriGagarin exclaimed 'I see Earth! It is so beautiful!' on his trailblazing flightin April 1961,? said Andy Turnage, ASE executive director. ?We are proud to bethe first to offer the public their chance to own unique photos of theirhometowns or other favorite locales on Earth." After hisreturn to Earth, Garriott will autograph each photograph and include a briefpersonalized message of the subscriber?s choice. The 8-by-10inch photograph is expected to cover an area of about 18 by 28 miles (30 by 45km) at a resolution of about 100 feet (30 meters) and be delivered in February2009, program officials said. Each subscriber will also be entered in a bonusraffle to win a memento that flew to space with Garriott, they added. Proceedsfrom the program will go to the ASE?s environmental and educational programs,as well as to the refinement of the ?Windows on Earth? software that Garriottwill used to find his Earth Portrait targets. "Manytimes I have gone outside my home to spot the space station flying overhead,? collectSPACE.comeditor Robert Pearlman told SPACE.com. CollectSPACE.com is acontent partner of SPACE.com on spaceflight history. ?What an amazingfeeling it will be, knowing that on one of those passes while Richard is upthere, he'll be looking down trying to photograph me... well, at least myhometown.? For moreinformation on Garriott?s EarthPortraits program with the ASE and collectSPACE.com, click here. Garriottis documenting his mission at his personal Web site: http://www.richardinspace.com.